← Would Led Zeppelin Succeed Today? 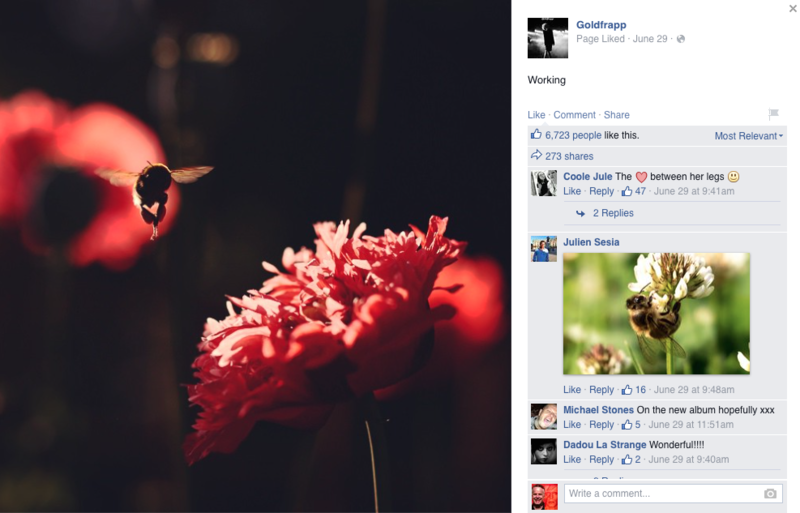 Recently, I was talking with a director about how artists use social media. He vowed never to use it. “Lifting the veil to your private life ruins the artist’s mystique,” he said. And he has a point. Sharing on social can connect artists with their fans, but social media can be problematic for musicians such as Beck, Jimmy Page, and Prince whose personal brands are built on the power of mystique. Their appeal comes from the walls that surround them, which makes them unattainable. 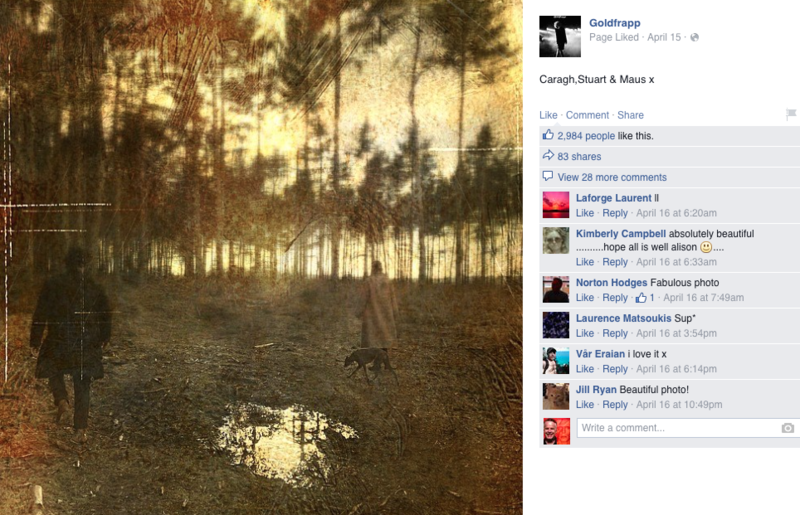 But as musician Alison Goldfrapp demonstrates, artists can actually use social media to create mystique. Alison Goldfrapp is one half of the duo Goldfrapp, which melds pop, dance, and electronica to create a sound that shimmers. The group is all about atmosphere. Its songs can sound lush and dreamy on an album such as Seventh Tree, and provocative on Black Cherry. The duo has carefully constructed a chic, ethereal vibe, grounded in Alison Goldfrapp’s mystique. Whereas Nicki Minaj is loud and sexual, Alison Goldfrapp is cool, sensual, and beyond our reach. She is like Ingrid Bergman reincarnated as a singer. 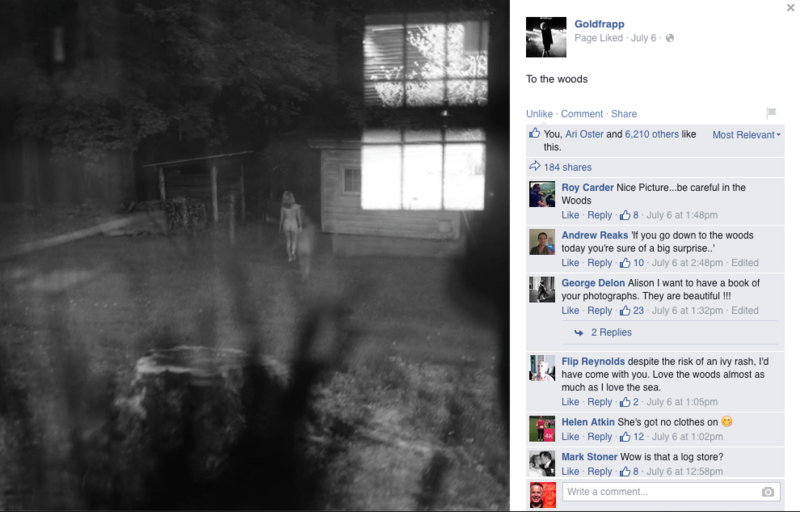 Seldom does Alison Goldfrapp provide context for the photos aside from cryptic captions. She leaves it up to her fans to fill in the blanks. In the fan comments section, she responds to no one, thus keeping everyone guessing as to how closely she pays attention to the content people post on her page. Powerful visuals can say more than words if your goal is to make an impression instead of explaining yourself to your audience. You create a mystique by sparking a conversation. When no one pays attention, there is no mystique. 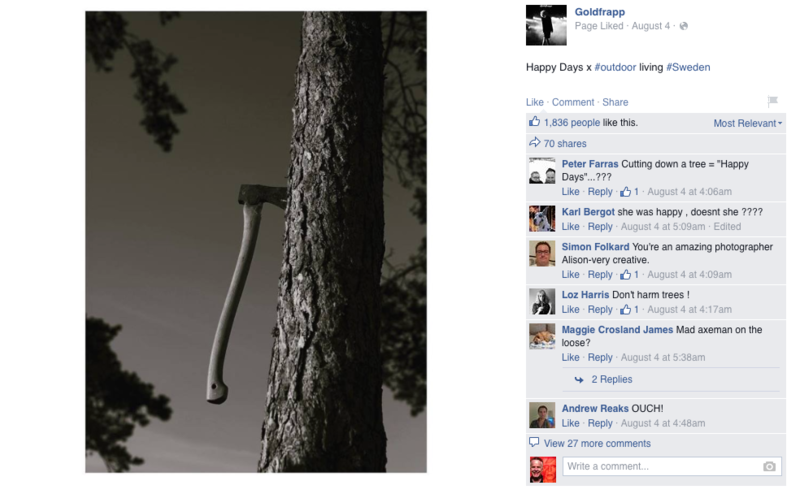 Judging by the comments on Alison Goldfrapp’s Facebook and Instagram accounts, she creates a conversation. But sharing does not have to mean joining the conversation. Allowing others to form their impressions of your art builds mystique. Being social does not have to mean being chatty. You can create a conversation and build a community though actions, not words. Who creates mystique on social media in your opinion? This entry was posted in Social media and tagged Alison Goldfrapp, David Deal, Facebook, Goldfrapp, Instagram, Superhype. Bookmark the permalink.